Next stretch jersey dragonfly top with long chiffon tie neckline. Used but in great condition. Fully lined Great style, quality & condition. This can be affected by different light conditions or your screen settings. Depending on your local screen settings photos might appear differently as e.g. brightness and colour settings can affect their look. Available in UK Sizes: 18 EU 46 DE 44. Colour: Blue with prints. Cotton jersey. Machine Washable. ORDER BY 2PM. The fabric is black jersey (96 viscose, 4 elastane), with a fine cotton panel on the front with white decorative stitching. In good used condition. Lots listed, mainly smaller, but happy to combine P P.
Baukjen jersey tunic top . Navy Size XL/ 18. Very versatille, great with leggings or trousers. Length from shoulder to hem is 34 inches. Sleeve length is 25.5 inches.Condition is Used. Dispatched with Royal Mail 1st Class. Ladies Top Size L By Quiz. In good clean condition. Pattern is highlighted with aurora borealis diamantés at the front and there is a lace panel at the back. Tracked postage and packaging quote is for UK. Gorgeous Klass Jersey Stretch Top - Size Large. A scoop neckline with short sleeves. A deep band to the hemline finishing mid hip. A lovely really useful top in a great neutral colour way. Black Draped Loose Fit soft Jersey Top Size 22-24 Yours. Very roomy, easy to wear top in good condition. Long loose sleeves. Great with leggings and jeans. Covers the bum/ hips area. Light enough to wear in summer as it is loose fit. Washes really well. No shrinkage. Can also be tied to one side. Dispatched with Royal Mail 2nd Class. South Grey Bird Print Jersey Top Size 24. 60% cotton 40% polyamide. Very slight uniform bobbling. Wrll loved but plenty of wear left. Condition is Used. Dispatched with Royal Mail 2nd Class. Karen Millen Top. Jersey stretch. Black Pink. 28" Collar to hem - Down back. 17" Pit to pit - Flat across back. Size Large. ♥ Feminine Rich Emerald Green Soft Touch Modal Vest Top from TU ♥ This feminine rich emerald green top is made from a quality super soft touch modal fabric; it is long, has a flattering scoop neckline, a lace hem, and a striking strappy back. Very unusual; a fantastic addition to any women's wardrobe! ♥ Label Size: UK 20 - please check the measurements below : ) Bust: 50" Length: 30" shoulder to hem Condition: New with tags! Any questions please ask : ) ♥. In excellent unworn condition size 18. Could be worn as a beach cover up as well. I AM CONSTANTLY CLEARING OUT MY OWN AND MY FAMILY'S CLOTHES, SWIMWEAR, SHOES, BAGS AND BITS AND PIECES, THAT WE DO NOT WEAR, DO NOT USE, OR SIMPLY DO NOT FIT ANYMORE. German designer BASLER, t-shirt style top in a soft stretch jersey. UK plus size 22. Top is elastane & viscose, plenty of stretch & the neck-line is banded with a black band with white marking. Length @ centre back = 25" approx. Lovely soft stretch jersey material. 100% lush item and and much nicer than pics have captured! ☆☆Plus Size 28☆☆. Ladies silky jersey type fabric top. Lime/orange/black/burgundy paisley type pattern on an ivory background. Size 22. Has frill around the bottom and an asymmetric frill at the front. Deep scoop neck and long sleeves. Hardly been worn so is in excellent condition. I'm happy to combine postage so please check out my other items. Animal print tunic with dped he Looks good with jeans or with leggings and boots. Condition is Used. 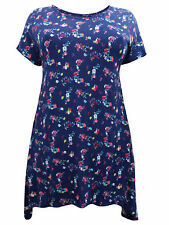 SIZE 26-28 PRINTED JERSEY BLOUSE IN SOFT HANDLE LIGHTWEIGHT FABRIC. LADIES WONDERFUL COMFORTABLE PINK TOP TUNIC DECORATED WITH BEAUTIFUL APPLICATION LACE AND GLASS BEADING, NICE SOFT STRETCHY WORM JERSEY, NEW HAND MADE, size 22,24,26. Condition is Used. Leopard face print on the front which is on a white silky polyester fabric, the back is stretchy plain white viscose/elastane jersey. Gold piping to neck, cap sleeves. REFLECTIONS Scoop Neck 3/4 Sleeve Petrol / Black / Cream Jersey Top size XXL Bow detail at neck. Small fit - more like XL. And these are my “discard” pile! Lots of good makes, mostly size 14-18, shoe sizes 39-41. Fade-dyed petrol blue. Stunning Silky Leopard Print / Animal Print Tunic Top in a Luxurious Stretchy feel. Looks beautiful with Black. Floaty Feel. Very Stretchy and roomy. 95% Polyester 5% Elastane Very stretchy. When lay flat under arm to under arm at the front 39" approx. Ladies Mustard & Black Colour Block Jersey Top From Amaryllis. Circle/Cut Out Detail At Front Where Mustard & Black Fabric Join - See Photo. Top 2/3 Are Mustard While Bottom 1/3 Black. Black Tie Detail. There is a flattering empire line seam (excellent for hiding tummies!). and an immitation drawstring at the neck. The top has a bust that goes up to 50", and is 37" long from nape of neck to longest point of the hem. M&S Deep Red Ladies Jersey Top T-shirt Uk 18. Condition is Used. Dispatched with Royal Mail 2nd Class. Racerback Sleeveless T-Shirt. by Karen Miller. Running Vest Top / Tank top. Don't miss ! Hardly worn, excellent condition. Gorgeous Animal Print Silky Jersey Tunic Top - Size 22/24. Fit n flare style, lovely silky feel fabric, drapes well. Animal print fabric in black/grey/ivory. Hardly worn so in very good condition. I'm happy to combine postage so please check out my other items. 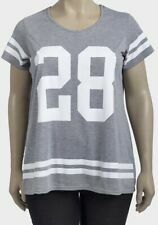 Lovely casual jersey top. LOVELY TOP . MAIN COLOUR : Blue. LENGTH FROM UNDERARM TO HEM 16”. UNDERARM TO UNDERARM 22”. IN A NICE CONDITION . 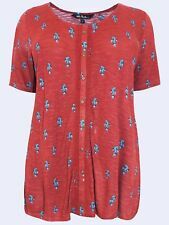 PLUS SIZE WOMEN ITALIAN LAGENLOOK HIGH LOW TOP LADIES STAR PRINT TOP DRESS 30"